In digital manufacturing extended supply chain visibility has proven to be both practical – leading to improved planning, scheduling and predictability – and pivotal – because it acknowledges supplier roles and the important value they provide. Information sharing builds trust, invites collaboration, strengthens team relationships and boosts reliability across the supply chain. But is it risky? In the digital manufacturing environment, there’s no need to sacrifice any of these synergistic benefits for the sake of data security. c5mi has developed a modular access-controlled Enterprise Blockchain solution that enables any supply chain network to securely share data to increase visibility and achieve business goals. c5mi Enterprise Blockchain combines with IoT tags and tools to power global track-and-trace capabilities from the source all the way to the individual carton, case or product level. Configured to meet specific objectives and governed by consensus, c5mi Enterprise Blockchain brings together a consortium of stakeholders united through a direct interface with their unique technology systems. For impenetrable security, all data entered in the Blockchain is encrypted at the source and stored across a vast distributed digital network. Enterprise Blockchain can permit or restrict access rights to certain types of transactions or data levels. Users may view permitted information within the chain – but are unable to modify, delete or otherwise corrupt any of the data. As a result, all stakeholders recognize “one version of the truth,” a common operational picture that is continually updated and authenticated. Visibility into real-time manufacturing and supply chain data gives participants insights into demand, production, logistics and transportation, product handling, even regulatory compliance. Working together engages participants, increases organizational efficiencies, and encourages innovation. 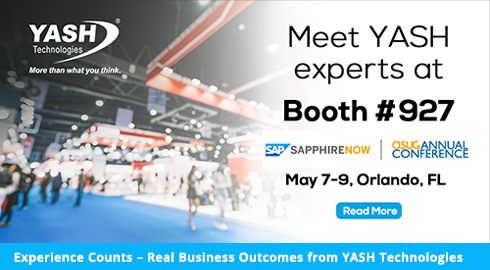 To discover how Enterprise Blockchain can help you gain control and reduce loss, visit c5mi/YASH booth #927 at SAPPHIRENOW 2019. Supplier Execution: Is your organization still dancing around the real issues? Process Excellence: Are you getting the results you want from your digital transformation?